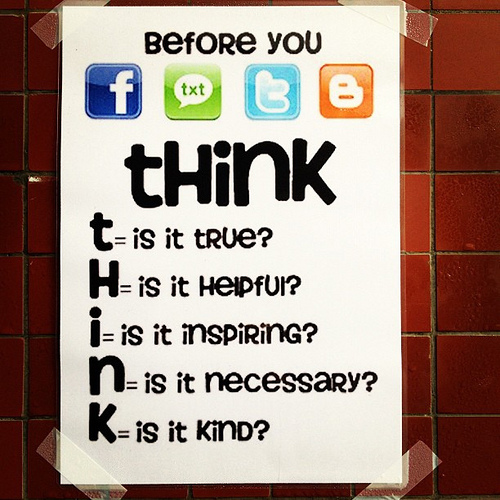 I find rule number 6 interesting as it assumes many students are posting things anonymously. Ever since I've been an IT teacher I've always been concerned about protecting the privacy of my students and not allowing them to be identified, but I'm wondering if this is perhaps giving them the wrong message, perhaps encouraging them to hide behind an anonymous name or avatar. Is this concern now outdated? In fact the internet is probably very safe. Millions of people book holidays and buy things online using their credit cards, and in the case of sexual predators, children are far more likely to be targeted by people they know such as family members. Nowadays when most schools offer lessons about staying safe online and how to use the internet responsibly perhaps it's time to rethink the "no real names" policies that many schools have adopted. Perhaps it's time to teach our students how to build positive digital identities, so that when someone Googles their name all the great things they have done are the first things that show up, not simply the silly photos they have been tagged in. 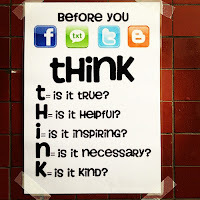 Thanks for posting these rules - It sometimes amazes me when we allow our students to think that online or cyber behavior is any different than personal behavior. Perhaps if we focus on that, the concern about the "no real names" policies can go away and student can be proud of who they are. I've been teaching for over 25 years in international schools in Europe and Asia and am currently working at the American School of Bombay in India. My blog reflects my thoughts and wonderings as an educator, a tech director, and R&D core team member. The writing, embedded material and material linked to via this blog is representative of myself alone. It is not representative of my school, its employees, my students or the students' families. Tech Transformation by Maggie Hos-McGrane is licensed under a Creative Commons Attribution-NonCommercial-ShareAlike 3.0 Unported License.